Do you know the history of defibrillation? Most people have a very broad understanding of defibrillation devices. Television medical dramas and movies give the impression defibrillators “shock a patient back to life”. Close… but not exactly correct (it’s not completely incorrect either). To gain a better understanding of the function these devices provide to a patient suffering from sudden cardiac arrest, a more thorough definition of the science behind defibrillation, and an examination of the history of the technology, is helpful. To understand defibrillation (or, “reversal of fibrillation” to employ basic English rules of grammar), one must first have a clear understanding of fibrillation – in this case, Ventricular Fibrillation – a fatal heart rhythm. The textbook definition of fibrillation is “the manifestation of chaotic electrical excitation of the chambers of the heart.” Ventricular fibrillation is the most common rhythm associated with sudden cardiac arrest. When the medical community of the 18th century began to understand ventricular fibrillation was the main culprit, they applied their new understanding of electrical impulses involved in cardiac rhythms, and experimentation began to discover the mechanisms behind the rhythms responsible for heart problems. Defibrillation, an electrical shock delivered to the heart, is the only treatment for ventricular fibrillation. While there have been many different applications of this process by means of direct defibrillation, external defibrillation, and implantable defibrillators, the idea behind these devices is exactly the same. The shock delivered to the heart interrupts the chaotic electrical impulses caused by the lethal rhythm and allows it to effectively “reset” itself. The sooner this shock is applied to the heart, the better a victim’s chances of survival. This technology is relatively new, having only been put into mainstream application since the 1920’s. Since that time, the advances in science and technology have combined to create products that are safe, simple and readily accessible to the general public. These advances have resulted in higher survival rates overall, but how did scientists discover the effectiveness of electricity in this application? During the era of scientific enlightenment, much progress was made in the discovery of the mechanisms of the human body. One of these discoveries was the breakthrough realization the human heart is an organ dependent upon electrical impulses to function, and the reason behind the “lethal rhythm” is the irregular rhythm we know today as ventricular fibrillation. One of the first scientific descriptors of this lethal rhythm is credited to the British physiologist, John A. McWilliams. In the late 19th century, McWilliams wrote of ventricular fibrillation and how it “wreaks chaos” across the fibers of the heart. While this is not an entirely accurate description, McWilliams introduced the hypothesis which prompted major research into different arrhythmias of the heart. Throughout the beginning of the 20th century, many animal models carried out at institutions such as Johns Hopkins University were able to demonstrate the ability to induce, and reverse, ventricular fibrillation via an application of electricity. This formed the basis for today’s defibrillation technology. Through these experiments, scientists discovered the mechanism behind chest compressions and cardiopulmonary resuscitation, although its application in emergency cardiac care was not implemented until later in the century. Initially, shocks were applied directly to the heart. In early experiments, the first applications actually used metal spoons and an AC current. As technology progressed, the field of electrophysiology learned shocks delivered to the chest through the skin could also reverse the lethal rhythm, and external defibrillation was introduced. Original devices were clunky and unsightly but improved in function and aesthetics as science and electrical technology advanced throughout the 1950’s and 1960’s. The advances made by many of today’s top defibrillator manufacturers during this time were rapid in scope and function, allowing for the steady improvement in the technology employed. From the open chest defibrillation of the 1920’s to the small, compact devices which can be installed in just about any and every place of public gathering today, the field of resuscitation through the use of CPR and AED (Automated External Defibrillator) deployment has single-handedly given victims of sudden cardiac arrest an exponential increase in survival rates. Defibrillators are essential links in the chain of survival treatment for victims suffering from the lethal rhythm of ventricular fibrillation, the most common cause of so many cases of sudden cardiac arrest. It is important to understand when someone is in Ventricular Fibrillation they are clinically dead; therefore, treatment with an AED can only help. However, their usefulness is only relevant if the devices are made readily available to the public for times of crisis. Today’s Automated External Defibrillators, a far cry from the initial metal spoons used in the first direct heart defibrillations, can actually detect ventricular fibrillation, and will not deploy a shock unless the patient is exhibiting this rhythm (or Ventricular Tachycardia – a separate, less common, rhythm also associated with cardiac arrest). The advances in technology have virtually ruled out any chance for error, making their use safe and simple. Definition of fibrillation taken from http://www.resuscitationcentral.com/defibrillation/history-science/. Askelrod, et. al.(2009). History of Defibrillation. Retrieved from http://bms.miet.ru/russdefihist/download/Cardiac_Bioelectric_Therapy,Springer,2009,015-040.pdf. 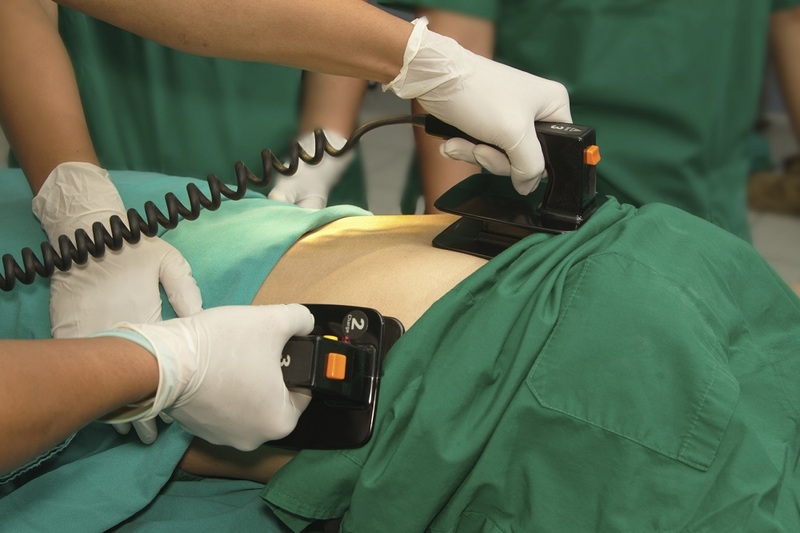 This resource gives a very detailed description of the history of defibrillation.